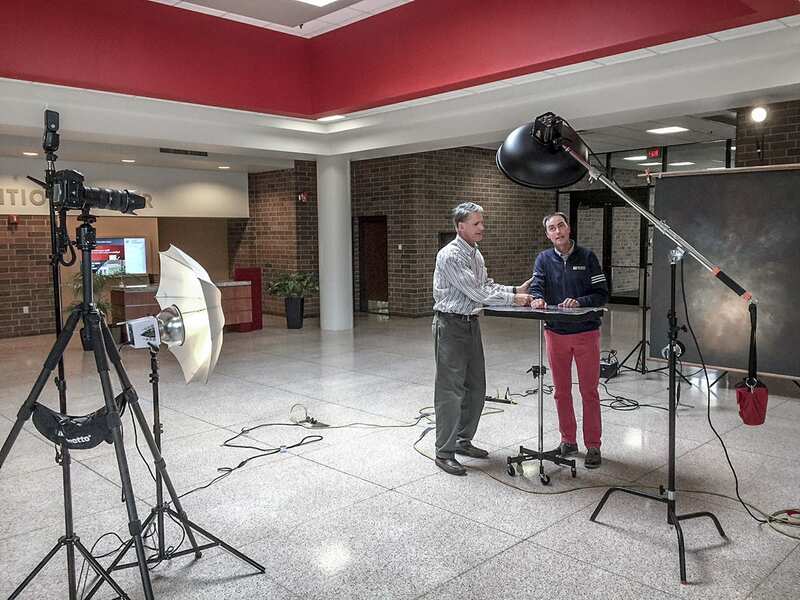 Being a location photographer has it’s challenges when it comes to business portraits. My lights, backdrop, stands, reflectors, tripod and boom arm all must fit in our shooting space with about 10 feet of clearance from subject to camera. I can shoot in small spaces but if I don’t have that 10 feet of distance, I am limited. I would need to use something other than my favorite portrait lens focal length (180mm), and go to a shorter length of 105 mm or 85mm. Photographing a client in the back storage area of his offices, (which had lingering indications of it’s former life as Taco Bell fast food restaurant – see the tera cotta colored tile floor), was a challenge because of the cramped shooting space and immovable clutter. Once my assistant gets the backdrop up, the main light (3 x 4 ft. soft box), the hair light ( SB900 speed light bounced off the ceiling mounted on a boom) the background light (SB 900 on floor aimed at backdrop), the subject’s chair and a facial reflector, I can then get back the ten feet I need with my camera to shoot the portrait. There is a lot to work around in the space but all I need is a “tunnel” to see from his chest to about 8 inches above his head. It’s workable. As Long as I have that “tunnel of vision” to my subject, I’m good to go. I compare it to the classic movie The Wizard of OZ, when Toto pulls back the curtain to expose the workings of the great OZ in the Royal Palace. OZ says: “Pay no attention to the man behind the curtain!” In other words, don’t look an inch to the right or an inch to the left because then you would see how it is done! Below is another example, shooting in a confined space. This was an industrial product test area. Sometimes, I have the luxury of an abundance of space. I can run cords anywhere. Boom arms can be extended and I can shoot with my Nikor 70-200 portrait lens racked out to 200mm, putting me at a comfortable distance from my subject. I have breathing space! 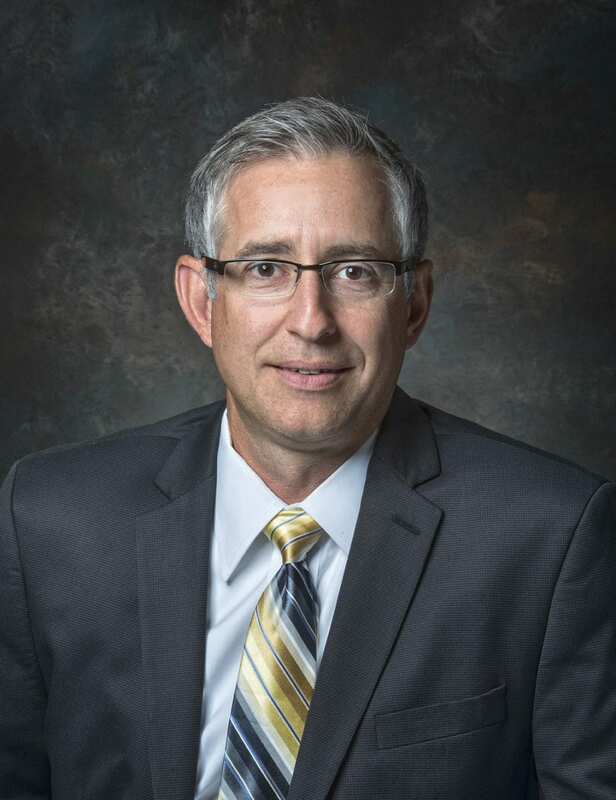 In the image below, which was shot in the KI Center’s lobby in Green Bay, you might notice the beauty dish has replaced the soft box. I now prefer the beauty dish to my soft box, simply for the light quality it produces for business portraits. The hair light is up high mounted behind the backdrop. The main light is comfortably extended on a heavy duty c-stand with a weighted boom. 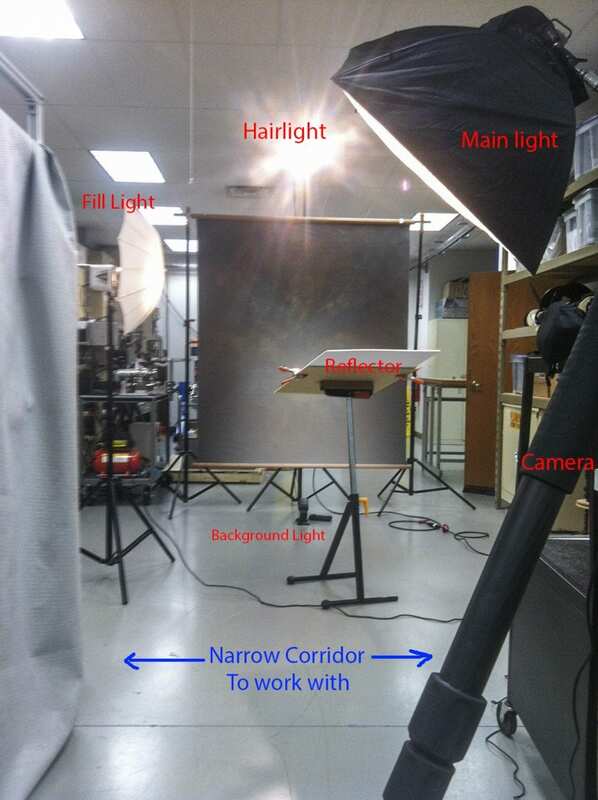 The fill light is “umbrellaed” just to camera left and set up low to fill in shadows. 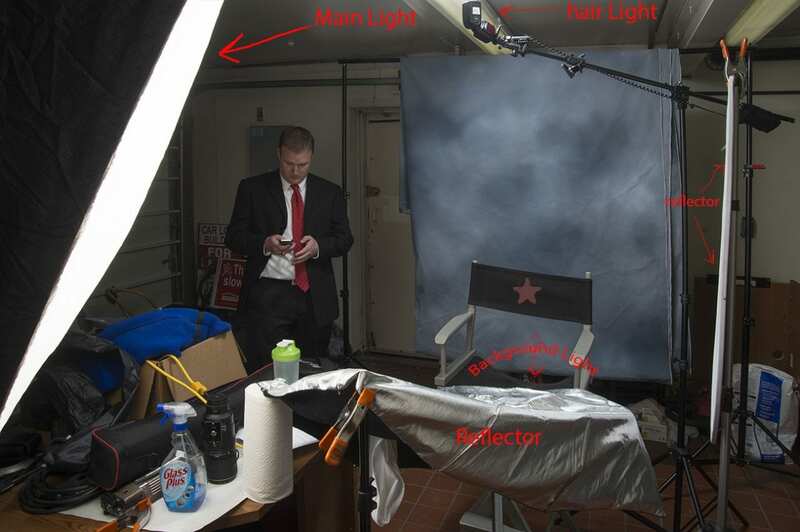 Just to the left of camera is a trigger speed light to set off all other strobes. That speed light is hard synched to the camera. This is a working environment I prefer to shoot business portraits. Having a variety of lighting and control equipment that I can tailor to the shooting environment is the key to making it work in almost any space- as long as I have that “tunnel of vision” to my subject and 10 feet of space in front. 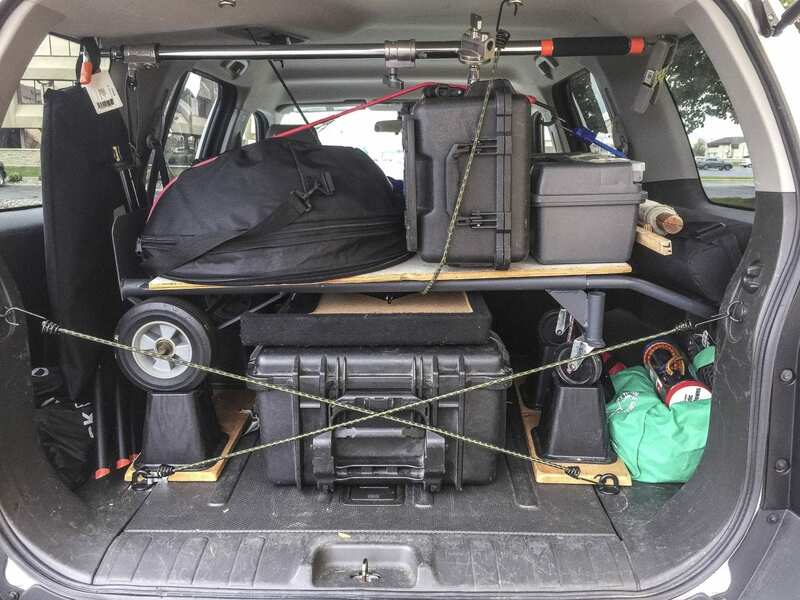 When finished, all the equipment fit’s neatly into the back of my Nissan Xterra, like a 3 dimensional puzzle. I’m good to go!